Apparently @WunderlistHelp just tweeted the following. If you’re missing lists, they are safe. Please sign out and back in again. So sorry for the trouble! I have not tried this, will check and report back. In the meantime, I believe Step One below is still a safe first tactic. It apparently works. My lists are restored. My morning is wasted, and I’m still incredibly angry with Wunderlist. I’m leaving the article up because I’d already sent out notices so this stands as both a data recovery tactic, as well as a reminder that some developers are sloppy and lazy when it comes to scaring the sh*t out of their customers. All may not be well with Wunderlist even given the support note. Read the comments thread below, particularly the one just added by Nino. Regardless, it does seem reasonable that if you use Wunderlist a lot, creating a local archive as described in Step 2 on a regular basis is just a sane thing to do given the history here. OK, the version of Wunderlist pushed out this week is deleting list items. It’s all over Twitter. Additionally, if you have multiple devices sync’d to Wunderlist, when you will open Wunderlist you get a glimpse of your list data, and then watch in horror as Wunderlist deletes it forever. Here are some things you should do now. Do NOT run Wunderlist! If you don’t run it, your local data is safe. Disconnect your devices from the internet before running Wunderlist. Different on wireless Macs and PCs, but for desktops this typically means just yanking the Ethernet cable out of the back of your computer. There, now Wunderlist won’t try to sync your data into nothingness. Once you’ve disconnected, you can run the app. For each list in Wunderlist, you can right click (at least on the Mac) the list title and choose “Email List.” This will compose an email with that lists contents, all the task names, their status (even completed tasks) and all the contents including notes you’ve added in the details view. You don’t actually need to send the list, copy it from e-mail to a Word or Text document and save that new document and you won’t lose your notes. If you’ve already lost your data, the’res a chance you can restore it. Run Time machine and restore that folder. If you’ve never used your Time Machine restore, now is a great time to go to Apple.Com for instructions. You may have Time Machine save the old folder if you want, but it’s likely pretty useless. Sorry, but I’ve only done this on a Mac, so you’re on your on on restore specifics. Same basic situation, restore that file if you can. Now, you’re not really safe after restoring. If you reconnect to the internet, Wunderlist is looking for time stamps on records, will see that records have been previously deleted, and then delete the task you just restored. This is just a step that you might do and then follow-up with that Second: Preserve Your Data step. You might also preserve a copy of this folder to your desktop or another folder just in cast Wunderlist comes up with a fix. Yes, now you have your lists preserved at least. Getting them back into Wunderlist is another thing. Likely you’ll need to copy/paste. But first, know that they have a bug and haven’t commented on it, so you may want to use something else, like a paper list for a while. Me, I pasted these lists into Evernote, which is a world-class application that has never lost my data. Maybe Wunderlist will fix this soon, and maybe they’ll never have a bug like this again. This entry was posted in Geeking around, Personal, Technology, Thoughts, Uncategorized, Writing. Bookmark the permalink. 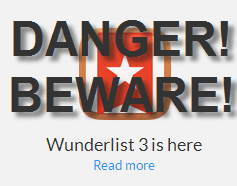 3 Responses to Warning Wunderlist Users! Yes, I still use Wunderlist, I have a paid subscription and find it essential.